Therapeutic modalities (interferential, microcurrent, ice, heat) are used to reduce pain & promote healing. Therapy used to promote joint motion/flexibility, reduce pain and accelerate healing. Dr. Davies uses Continuous Passive Motion (CPT) by motorized Leander traction table. Low level light therapy is a class 3b FDA approved device utilized to treat both acute and chronic injuries. 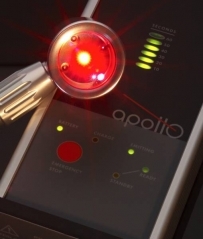 Our Doctors use the Apollo laser which is one of the most powerful and deep penetrating Class 3b lasers available to physicians. This laser's deep penetration comes from a 810 nanometer wavelength and 1600 watts of power that provides a 97Joule dose of laser therapy per minute. With older and less powerful lasers, treatment times needed to be as long as 30-45 minutes to achieve the same therapeutic benefit this laser can provide in 1-2 minutes. The advantage to this is that high powered lasers like this can be used conveniently along with other treatments to provide the best and most effective treatment session. Evaluating of the texture, tightness and movement of soft tissue allows Dr. Davies to diagnose specific problems that can either be the primary cause or contributing cause of many common conditions. Various type of manual treatment to the soft tissues can be used to break up scar tissue in muscle and fascia to restore range of motion and promote functional healing. Manipulative therapy is a extensively researched manual Physical Medicine procedure that is utilized to restore joint motion, provide flexible healing, promote function and enhance/complement physical rehabilitation efforts. Dr. Davies personally evaluates and prescribes individualized physical rehabilitation programs for a wide variety of injuries and conditions. All rehabilitation programs were created by our team, use state-of-the-art functional training equipment and are grounded in current researched-based rehabilitation principles. Dr. Davies routinely incorporates the benefits of our state-of-the-art Aquatics Center for a wide variety of conditions. Aquatic Therapy reduces the stresses to joints and allows patients to get active sooner on their road to recovery. Evaluation & plaster casting to prescribe custom foot orthotics produced by Langer Biomechanics.